Patient education on asthma can reduce related hospitalizations, emergency visits, and deaths. Adapted from references 2 and 4. Adapted from references 2 and 5-8. Treatment plans for asthma entail the management of acute asthma attacks and chronic symptoms. The National Asthma Education Prevention Program (NAEPP) recommends a stepwise approach for asthma management that tailors medication to the severity of the asthma and the patient’s individual needs (Figure). The NAEPP Guidelines for the Diagnosis and Management of Asthma can be found online at www.nhlbi.nih.gov/guidelines/asthma/asthgdln.htm. *According to guidelines from the National Asthma Education and Prevention Program. Although asthma is a chronic condition, it can be successfully managed through patient education and adherence (Online Table 4); with effective therapy, patients can lead normal, healthy lives. Ms. Terrie is a clinical pharmacist and medical writer based in Haymarket, Virginia. Asthma in the US Centers for Disease Control and Prevention website. www.cdc.gov/VitalSigns/Asthma. Accessed March 3, 2014. Asthma’s impact on the nation. Centers for Disease Control and Prevention website. www.cdc.gov/asthma/impacts_nation/asthmafactsheet.pdf. Accessed March 3, 2014. National Asthma Control Initiative. National Institutes of Health National Heart, Lung, and Blood Institute website. www.nhlbi.nih.gov/health/prof/lung/asthma/naci/pubs/naci-factsheet.pdf. Accessed March 3, 2014. Morris MJ. Asthma. Medscape website. http://emedicine.medscape.com/article/296301-overview. Accessed March 3, 2014. What is asthma? Centers for Disease Control and Prevention website. www.cdc.gov/asthma/faqs.htm. Accessed March 3, 2014. Asthma in adults fact sheet. American Lung Association website. www.lung.org/lung-disease/asthma/resources/facts-and-figures/asthma-in-adults.html. Accessed March 3, 2014. Asthma. Merck Manual for Healthcare Professionals Online Edition website. www.merckmanuals.com/professional/pulmonary_disorders/asthma_and_related_disorders/asthma.html. Accessed March 3, 2014. What are the signs and symptoms of asthma? National Institutes of Health National Heart, Lung, and Blood Institute website. www.nhlbi.nih.gov/health/health-topics/topics/asthma/signs.html. Accessed March 3, 2014. Expert panel report 3 (EPR-3): Guidelines for the Diagnosis and Management of Asthma. National Institutes of Health National Heart, Lung, and Blood Institute website. www.nhlbi.nih.gov/guidelines/asthma/asthgdln.htm. Accessed March 3, 2014. Asthma. American Academy of Allergy, Asthma & Immunology website. www.aaaai.org/conditions-and-treatments/asthma.aspx. Accessed March 3, 2014. How is asthma treated and controlled? National Institutes of Health National Heart, Lung, and Blood Institute website. www.nhlbi.nih.gov/health/health-topics/topics/asthma/treatment.html. Accessed March 3, 2014. Elward KS, Pollart SM. 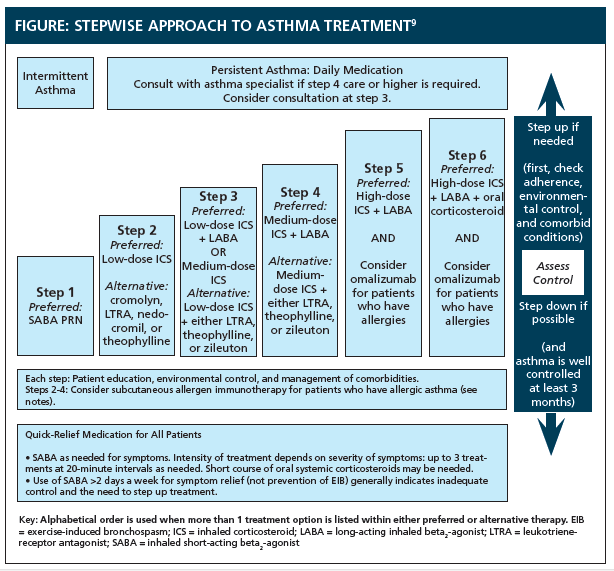 Medical therapy for asthma patients: updates from the NAEPP Guidelines. Am Fam Physician. 2010;82:1242-1251. Boulet LP, Vervloet D, Magar Y, Foster JM. Adherence: the goal to control asthma. Clin Chest Med. 2012;33(3):405-417. Gillisen A. Patient’s adherence in asthma. J Physiol Pharmacol. 2007;58(suppl 5):205-222. Divertie V. Strategies to promote medication adherence in children with asthma. Am J Matern Child Nurs. 2002;27(1):10. Sumino K, Cabana MD. Medication adherence in asthma patients. Curr Opin Pulm Med. 2013;19(1):49-53. Bender BG, Bender SE. Patient-identified barriers to asthma treatment adherence: responses to interviews, focus groups, and questionnaires. Immunol Allergy Clin North Am. 2005;25:107. Global strategy for asthma management and prevention. Global Initiative for Asthma website. www.ginasthma.org/documents/4. Accessed March 3, 2014. Williams LK, Joseph CL, Peterson EL, et al. Patients with asthma who do not fill their inhaled corticosteroids: a study of primary nonadherence. J Allergy Clin Immunol. 2007;120:1153. Weinstein AG. 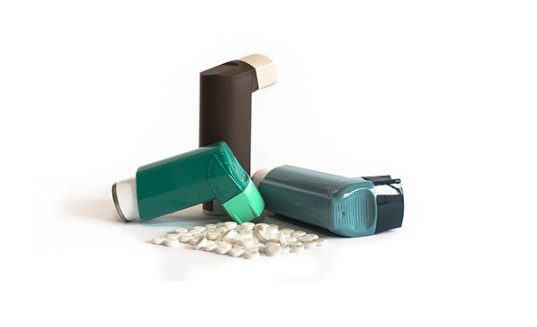 Should patients with persistent severe asthma be monitored for medication adherence? Ann Allergy Asthma Immunol. 2005;94(2):251-257. Asthma care quick reference: diagnosing and managing asthma. National Institutes of Health National Heart, Lung, and Blood Institute website. www.nhlbi.nih.gov/guidelines/asthma/asthma_quickref.htm . Accessed March 3, 2014. Asthma: treatment and management. American Academy of Allergy, Asthma and Immunology website. www.aaaai.org/conditions-and-treatments/asthma.aspx. Accessed March 3, 2014.